To provide for recoverability of Oracle database, make sure you have an application-consistent backup of your Oracle server machine created successfully. For more information on an application-consistent backup, see Application-aware Image Processing Settings. Also, if you plan to restore the database to its state as of the certain point in time (not necessarily the restore point, that is, backup or replica), then log processing should be configured, as described below. Go to the Jobs tab and select your Oracle server backup job. Click Job on the toolbar and select Edit job to start the job wizard. Proceed to the Guest processing step of the wizard and make sure the Enable application-aware image processing check box is selected. 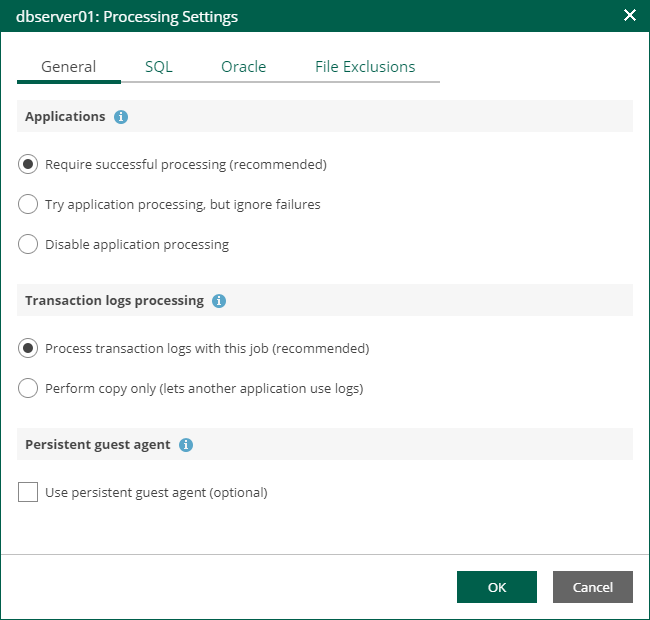 Click the Applications button, then in the dialog displayed, select the Oracle server machine from the list and click Edit. On the General tab, make sure you have the Require successful application processing option selected in the Applications section. Also, to be able to specify transaction log handling options, make sure the Process transaction logs with this job (recommended) option is selected. Otherwise, if you select Perform copy only (lets another application use logs) option, Veeam Backup & Replication will create a copy-only backup, and transaction logs will not be purged — that is why the Oracle tab with log handling settings will be deactivated in this case. To read mode, refer to the copy-only backup description in the Veeam Backup & Replication User Guide. If both Microsoft SQL Server and Oracle Server are installed on one machine, and this machine is processed by a job with log backup enabled for both applications, Veeam Backup & Replication will back up only Oracle transaction logs. Microsoft SQL Server transaction logs will not be processed. 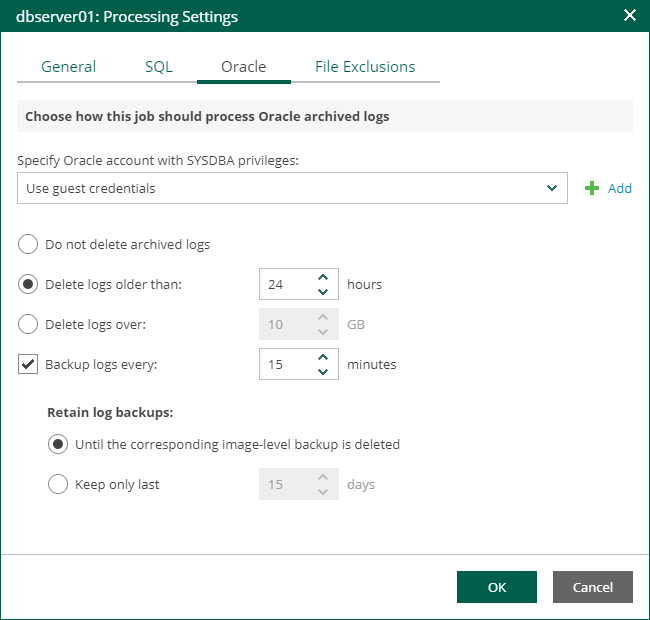 Specify a user account that will connect to Oracle system and perform Oracle archived logs backup and\or deletion. You can select Use guest credentials — then Veeam will use the account specified for guest processing in the job configuration for both guest OS access and for connection to Oracle system - or specify another account, selecting it from the drop-down list or adding a new account. In any case, make sure the account you specify here has sufficient rights — see the Required Permissions section in the Veeam Explorer for Oracle guide for details. Do not delete archived logs — this option instructs Veeam to preserve archived redo logs (if any) on the original Oracle server. With this option selected, your database administrator will have to take care of database logs. Applicable restore scenario — database restore to the state as of currently selected machine restore point, to selected point in time and to selected transaction. Delete logs older than <N> hours/over <N> GB — with this option selected, Veeam will wait for the image-level machine backup to complete, and then it will trigger archived log deletion from guest, using the specified condition (log age or size). If archived logs cannot be deleted for some reason, these logs will remain untouched in the guest machine until the next start of the Veeam runtime process. With any of these options, you can also use the Backup logs every <N> minutes check box — if selected, Veeam Backup & Replication will periodically ship archived logs to the backup repository and store them next to the Oracle server machine backup. Make sure that Oracle ARCHIVELOG mode is turned on (contact your database administrator, if necessary). This option will support any database restore scenario: to the state as of in currently selected machine restore point, to any point in time or to the state before particular transaction. If you plan to use this option together with archived logs deletion from Oracle machine guest, make sure that these settings are consistent: logs should be deleted after they are backed up to repository, not vice versa. Thus, you need to set up backup schedule and log removal conditions appropriately. Default log backup interval is 15 minutes, maximum interval is 480 minutes. If you selected to backup archived logs, specify how long they should be kept, using the Retain log backups options. It is recommended to keep logs Until the corresponding image-level backup is deleted; otherwise, you should manually check and ensure that your database and log backup retention policies are consistent, providing all the machines restore points and log backups required for database restore. On the Job schedule step, make sure the scheduled run is enabled for the job, otherwise, log backup will not be activated.